First, I read this article about a mother who decided to abandon her children to pursue her own goals and help her family learn to be more "independent." The next day, I had a long talk with a friend who has beautiful, healthy, happy children but is miserably depressed with her life. I then read this article on CNN about a mom who, along with her boyfriend, beat her 3-year-old for wetting his pants, and then sat watching a movie and eating pizza while he was dying. Finally, I had a conversation with a fabulous friend in her early 30s who is excited to have children but is concerned that the workload/mommy lifestyle might be harder than she has anticipated — and she's absolutely right. Traveling, enjoying long conversations and spending a substantial amount of time outside don't typically mesh well with motherhood. The realities of this life are a rude awakening for most of us (but, of course, the beauty of it is often a pleasant surprise, as well). (1) Why do so many mothers struggle with motherhood? (2) What can I do to help? As I pulled into the elementary school parking lot this morning, I explained to my children that the whole reason I work on The Power of Moms is because motherhood IS really hard, but it can be beautiful if you learn how to create a family that "works." My goal is to help moms get the support they need, which strengthens mothers, and thereby changes our societies. (1) Mothers have to take care of themselves. A few years ago, I wrote an essay called "Mommy is a Person," which emphasizes that mothers need (and deserve) the basics: sleep, exercise, time alone, time to develop talents, etc., but there's a much deeper level of care that I didn't even touch. If a mother has drug or alcohol addictions, mental or physical health issues, eating disorders, extreme financial stress, or other challenges I can't even begin to list, fixing those problems needs to be a high priority. Those problems don't just go away while we're watching "Dancing With the Stars," and there are many, many organizations out there with resources to help. We need to face these kinds of issues head on and take care of them. Of course, some mothers are going to feel discouraged and depressed if their house is a wreck, their children are bouncing off the walls until midnight, they never get any time to develop their talents or socialize with their friends, and they're jumping from one catastrophe to the next — without a clear plan for the day. No one expects that kind of life to be enjoyable, but no one is forcing mothers to live that kind of life. (2) We need to realize (and teach the next generation) that children are not pets. If I buy a dog, and "it just doesn't work out for me," then it's very easy to put that dog up for adoption or sell it on Craigslist. Once I have a child, I am a parent. Without trying to be funny, I'd like to point out that there isn't a "children" category on Craigslist. This is a serious responsibility, and I don't know if our society just hasn't done a good enough job teaching this, but for some reason, there's this idea out there that parenthood is an opt-in, opt-out kind of thing, like adding caller ID to your home phone service. Children are precious gifts that we have the opportunity to love and raise. We need to have our eyes wide open before we take on this responsibility. I'm extremely careful to explain to my children both sides of parenting. I let them know that they are my greatest source of happiness, and I love to be with them, but I also let them know that I get tired, and sometimes I want to take a break, and sometimes I need them to help me so I don't go insane. Mothers, and others in society, need to be VERY clear about what it takes to raise a family. Otherwise, if a mother thinks her life is going to be one Pottery Barn catalog after another, she's going to be running for the hills by day three. (3) Problems can be solved within the family. Saren recently wrote an excellent post about this exact issue. We don't need to leave our responsibilities to "find ourselves." We just need to be smarter about how we structure our family life. I know that not everyone has a healthy marriage, enough funds to pay the bills, or support from friends and relatives. But I DO know that mothers have the power to create the kinds of homes they need and want; it's not easy, but it's possible. I've seen it happen in the homes of women whose lives have been harder than I imagined possible, and if they can do it, we can do it. That's the whole point of what we're doing at The Power of Moms: Retreats, Learning Circles, The Bloom Game, Mind Organization for Moms, daily articles, podcasts and everything else we're in the process of creating. There are tons of smart women out there who can teach us how to love this challenging, demanding, sometimes-chaotic life, and I want to enhance my mothering experience by learning from as many of these ladies as possible. The bottom line is that families are the basic unit of society. Strong families, strong nations. I know that being a mother is an extremely difficult job. I know how it feels to be stressed, exhausted, discouraged, depressed and inadequate. But I also know that if mothers (and fathers) will band together, pledge never to give up, and do whatever we can to strengthen and support each other, our nation, and all the nations of the world, have a very bright future. QUESTION: What other ideas do you have for strengthening motherhood? CHALLENGE: If you're currently struggling with some aspect of raising a family, identify one way you can get the support you need — and then do it. Labels: Motherhood Matters, strengthening mothers, The Motherhood "Mind Game"
The New Power of Moms is UP! I can't explain how many hours have been spent behind a computer screen (by me, Saren, Jared, Alisha, Lisa, Allyson, and Anna) to get this new website ready to launch. I owe a HUGE thank you to all the board members at The Power of Moms who make this organization work. They are incredible. And now that this new site is up, we're hoping to get some regular bedtime hours back in place, and I'm thinking I might actually start keeping up with this blog. So without further adieu . . . Dun-duh-duh-DA! 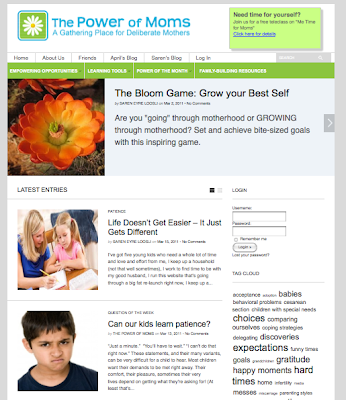 The new version of The Power of Moms is here (click on the logo below). Today has been a great day, but I must admit that Saren and I are feeling a little tired. We've been working (with our amazing board members) during every spare moment for weeks to plan our April Retreat, coordinate the new book we're publishing, strengthen the foundation of our growing organization, and get our new website ready (you can take a sneak peek at http://new.powerofmoms.com). I absolutely love working on meaningful projects and associating with the moms at The Power of Moms, but sometimes when I look at the projects around my house that aren't getting done, or reflect on the fact that I have very little "down time," I wonder if I'm being as effective with my time as I ought to be. I try not to let any of this work bleed into my time with my children, so I end up working in the middle of the night, early in the morning, during ten-minute pockets during the day, etc. Then I see things like this blog post, and I realize that this is so much bigger than me. A couple of years ago, I wrote an article for the website called "Defying Gravity." I felt like everything in the world was trying to pull me away from accomplishing my dreams, so I decided to start listening to the voice inside that tells me I can become more--in spite of the everyday "gravity," and without having to sacrifice the quality of my family life. Then Saren and I included that article in our Learning Circles program, and the feedback I've received from that one article--written over the course of a week while I was suffering through some health problems--reminds me that you can never really measure your influence. You never know how something you do is going to help someone else. And you can't anticipate how someone ten times as talented as you are might build on your small little effort. I see all my flaws very clearly. I know painfully well how much I am lacking, and I know how much work it's going to take to get where I want to be. But at the same time, I have to be satisfied with what I am able to give today. I think of all the incredible people who inspire me each day, and the majority of them have no clue that they are the ones who keep me going. So today's post is meant to thank the people out there who live deliberate lives, share the beautiful things they're learning, lift those around them, and influence the rest of us who appreciate them more than we can ever say. Have you ever had an experience where something small that you did influenced others for good? Or a time when another person's life powerfully influenced you? Hi! This is Alia! :-) I am blogging for my mom right now. 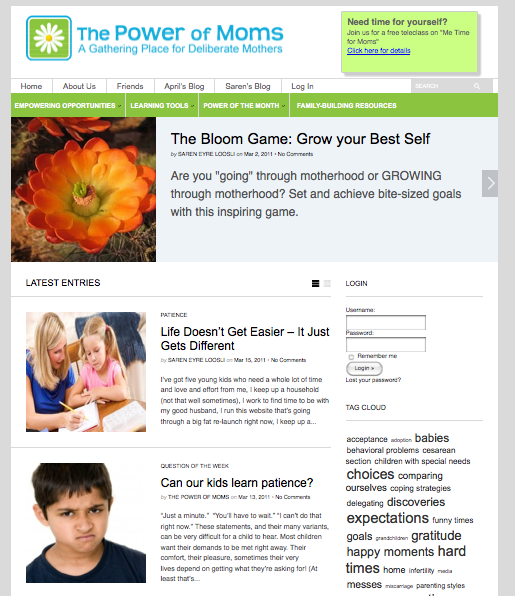 My mom has been working really hard, and she and Saren are excited to launch the new Power of Moms website this week. In our church, many people spend a year and a half or two years as missionaries, helping teach other people about how much God loves them. My Aunt Trisha went to Houston, Texas on her mission, and one day she was going to attend a baptism, and they wanted to sing a special song for the person being baptized. Trisha went into a room at the church, and she was able to write an amazing song in under an hour. When she came home from Texas, she played the song for our whole family. Even though it is in Spanish, we all enjoy it (I have even learned to play it on the piano!). Here I am, entering through the door that He has shown me. Here I am, changing and allowing Him to cleanse me. Here I am, on this narrow path, and on it I will stay. Here I am, witnessing of His love, and I always will. And I will continue forward with a steadfastness in Christ. And I will continue forward with a brightness of hope and love. From today, I promise to follow and trust Him. From today, I leave behind the errors and receive His great peace. From today, I make covenants with Him, and to them I will be faithful. From today, I am a follower of Christ, and more like Him I hope to be. 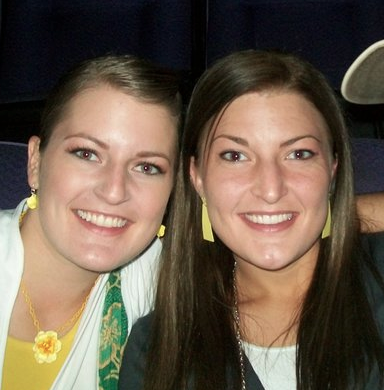 A few years after my Aunt Trisha came home, my Aunt Jodi went on her mission to Baguio, Philippines. She also wrote a song (in English only). Far from the Shepherd's care. With helpless feelings of despair. Sitting in the darkness, alone and cold. And I know not where to go. I see Him standing there so lovingly. His arms outstretched, I run to Him and embrace my Shepherd there. His Gentle voice speaks peace to me, and remind's me He's always there. I am lost no more. I think that they did a great job with their songs. We love you, Trisha and Jodi! Today I took Spencer with me to the grocery store, and I was amazed at how much fun it was to be with him. He got really excited about these shamrock cookies they had on display, so I just had to give him one, and he marveled at it with huge eyes as he said, "I can eat it? Please?" Then he wanted to help me bag the fruit, and he loved counting the pears, and then he showed me how he can walk backwards, and then he kissed me at least six times before we'd finished with the produce. I thought, "Wow. Grocery shopping is so much fun when you have a little guy with you." Spencer didn't want to get out of the van, so he started jumping back and forth over all the seats, finally ending up in the driver's seat--which is a train wreck waiting to happen because he shoves things into the CD player (which hasn't worked for 9 months now, thanks to Spencer), and he turns on the windshield wipers, lights, etc. I tried to grab him, and that turned into a 15-minute tantrum where I had to strap him in the stroller to keep him from hurting himself (and me), and then I had to bring in all the groceries while he screamed and kicked and wailed at the top of his lungs. Fortunately, I have patient neighbors. Once he finally agreed to say, "I'm sorry I was mean Mommy, and I will choose to be nice now," I let him out of the stroller, and he helped me bring in the groceries. Except "bringing in the groceries" means picking something out of a grocery sack and flinging it into the kitchen--yogurt, frozen veggies, sacks of peaches . . . . Yep, we ended up with about 20 peaches (good sale) ALL over the garage floor, and then he wanted to pick them all up HIMSELF while I held the bag for him, and that took about 3 minutes. But finally, I got him some food, and he calmed down, and it's now naptime. Articles are encouraging and empowering. I don't feel alone in the struggle to be a good mom. Honest stories about the ups and downs of motherhood. It gives me a daily reminder to look at motherhood in a positive light. To be uplifted and encouraged and to see that I'm not the only one going through the issues I'm having as a mother. Connection to other mothers who are trying to parent on purpose. 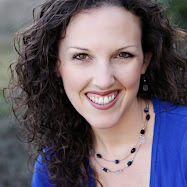 It encompasses everything I hope to use to follow my passion of helping other moms on their journey. I have just discovered your site so I look forward to exploring it more and more. I have felt on more than one occasion that what I am reading is inspired and what I needed in that moment. I come to your site for ideas on how to take care of the woman within and to be inspired to be a better mother on a daily and sometimes hourly basis. I think what you offer is education, ideas, and support. Primarily the opportunity to connect with moms in a powerful way. I appreciate the blog posts/articles because it increases my sense of connection with other like minded moms. I also appreciate how diligent the founders are in presenting new, creative and varied ways of linking mothers together. I love grounding myself in good principles. I find direction when I visit the site. 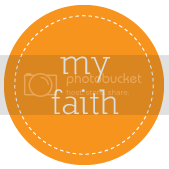 I find comfort and strength in seeing the trials and triumphs of other intentional mothers. I love that the emphasis is on positive mothering and that it is a deliberate choice. Perfection is not necessary to be a great mother! This is what I want to be a part of. It "professionalizes" being a mom. It takes being a mom seriously, the good and the bad. I come because reading the articles makes me feel validated. I come to the website to read and gather great thoughts and ideas of other moms that help me improve myself and my family life. 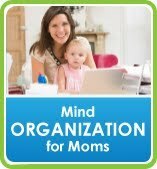 I love to learn and find out more about ways that make motherhood an easier task or help me be a better mom. How inclusive the reach is; it's not just for one "kind" of mom--it's for purposeful moms. To be a better mum, a more organised mum and one that still has God at the forefront of her life. Women need to realize that there is a strength from working together. We will find much more power and success for ourselves and our families if we learn from each other. This website offers opportunities for that specific type of learning in real time. To help me grow in my mothering journey in becoming the type of Mum I want to be. The ideas offered are wonderful at helping me see either that other people do this too / feel this way too, or give me food for thought of ways I can be a better Mum right now, or where I'd like to be heading. I have a hard job as a mother and I appreciate insights others have and love to hear about what worked or didn't for them so I have new ideas to work with. I want to be a better Mom. I just need role models and ideas, because the world does not have the Mom that I envision portrayed, and Power of Moms does. I think it's important for all the moms out there to know that their motherhood is powerful. Mothers can change the world through the way they raise and teach their children. It's nice for us all to know we're not alone. I come for daily inspiration. I love it. It has changed the way I view mothering and the way I mother. I don't have like minded moms around so I like coming to the site and feeling like some of my opinions about mothering and my family are validated as other moms feel the same way. For ways to keep at it as a mom. When on the site I realize am not alone in my endeavors to raise a happy child while keeping my sanity. Because I like to see that other moms have similar thoughts and daily trials as I do. It helps me to fully enjoy being a mom! The positive and realistic approach (through your articles-I haven't had a chance to attend one of your retreats) to not just how to be a better mother, but how to be a better person. It is all intertwined-when we try to better ourselves, our family benefits. The same goes for working on being a better mom, it helps us become a better person. It is so easy to feel like I get "lost" in being a mom, without taking time for myself. Your website has the tools to help me balance both. Power of Moms is so important because not everyone knows how difficult and important the work of a mother is. To have a place to support each other and to explain to the world the difficulties and the triumphs and the power of positive mothering is life changing and world changing. I also love how the Bloom Game gives me a way to progressively improve in a customized way that doesn't overwhelm me. Mothers are overwhelmed and this site and the game make it more manageable and more supportive. Um, just thanks. It is good to have moms that support each other. I love reading articles by other Moms and seeing how we all struggle with similar things and how people seal with their challenges. I have enjoyed being a Learning Circle leader, and have seen the help and hope Learning Circle material has given to those in my group. I visit the website to get new ideas on how to handle age-old problems we are constantly dealing with as mothers. I've recently joined because of the Mind Organization that was offered. I've enjoyed my recent visits to your website because of the great articles I read regarding motherhood. I look forward to learning more about becoming the mom I want to be. I love the articles. I usually identify with the topics presented and almost always laugh out loud while reading them to myself. It makes me feel that I'm not alone in my mothering journey and I appreciate the candor, but always positive spin from the writers. I also appreciate the quality of the writing. That's why I have not applied for entrance into this "writers' club". Almost all of them are articulate and clear all the while keeping the feeling of their pieces light and happy. This is a great boon to my spirits as I prepare to enter the trenches one more day...and hopefully love it as much as they do. I usually enjoy reading articles that apply to some of my personal challenges. I usually come away with a new idea or just encouragement to keep on going with the challenges I face as a mom and usually feel validated in the sense that I am not alone. I like knowing that my challenges are not just my own but that others have similar challenges and are finding ways to overcome them. It gives me hope. I come because every time I do....I leave feeling empowered to be a better mom and woman. I love the encouragement, the ideas, and the feeling of unity. Thanks to everyone for filling out our survey. We appreciate you and love working with you.